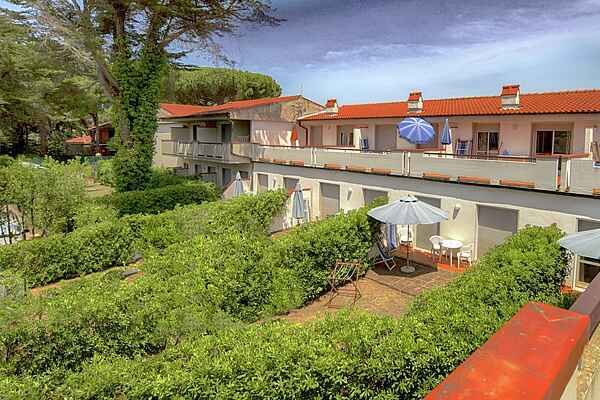 A residence with 30 apartments in Tombola di Gianneli: a narrow stretch of land with a view of the sea at the foot of Monte Argentario, where the beach extends for 7 km. The area has unique maritime pine trees and other vegetation, and is an ideal spot for recreation, sport and relaxation. The area around Gianella has a reputation for being quite chic. Monte Argentario offers exceptional natural beauty, with beaches and old fishing villages such as Porto Ercole and Santo Stefano. From the harbour of Santo Stefano you can hop on the ferry to Giglio Island or Giannutri nature park. On the mainland you will find a landscape of forested hills, olive trees and vineyards. The residence's apartments are simple in design and all have a terrace or garden.